The Tudor 4 - 475mm High - 4 Column - Cast Iron Radiator is a very traditional Edwardian type radiator, carefully crafted to offer a versatile choice of heights and widths. The simple column design of the Tudor gives a contemporary feel for the more modern setting as well as an authentic feel for the period home. This wonderful Cast Iron Radiator is available in a choice of numerous finishes, click on the orange tab above called 'Colour Options' for more information. The Tudor 4 - 660mm High - 4 Column - Cast Iron Radiator is a very traditional Edwardian type radiator, carefully crafted to offer a versatile choice of heights and widths. The simple column design of the Tudor gives a contemporary feel for the more modern setting as well as an authentic feel for the period home. The Tudor 4 is available in 4 heights, 360mm, 475mm, 660mm and 760mm and is hand made in the UK. The Radiator Company Priory - 2 Column Cast Iron Radiator has a simple yet beautiful design. It has a style that is rustic and charming. The Priory has a roughcast finish which adds to the traditional look. Buying a cast iron radiator should be an enjoyable and creative experience and the Great Rads Customer Service Team are here to help if you have any questions or concerns about your cast iron radiator or finish choices. Here are some questions which we are normally asked, but please feel free to telephone 01803 450330, or email on sales@greatrads.co.uk - we are here to help. What is the difference between a section and a column? Cast Iron Radiators are custom built section by section the old fashioned way by hand and pressure tested prior to delivery. The individual sections of a radiator are shown below. 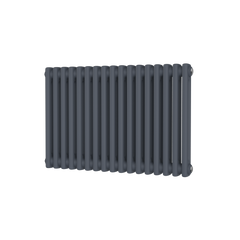 Each section has a BTU output therefore if a section is 400 BTU in size and you require a 4,000 BTU radiator you will need a 10 section radiator. Each section has a number of columns within its design. Please see the diagrams below for clarity. What is a BTU and how do I calculate what BTU I require for each of my room spaces? A BTU is an abbreviation for British Thermal Unit which is a unit of energy used to measure heat output. The Great Rads Team can easily calculate your heat output requirements by asking you a few simple questions go to our BTU Calculation page to learn more. How long will my radiator take to be delivered? As your Cast Iron Radiator is custom built to the size you require, section by section and custom finished to your specifications this takes time within our UK workshop. We currently offer a 1 week lead time from order for custom metallic painted orders and a 2 week lead time for all other finishes. When you place your order with us a delivery date option will be given to you. Is my brand new Cast Iron Radiator going to be easy to install onto my system? Yes it is as easy to install as a normal conventional radiator.Your system can have one cast iron radiator added as a feature or every room can be fitted with cast iron radiators. The choice is yours and the installation is straight forward. Why do Cast Iron Radiators custom build radiators? The radiators are custom built to make sure that the cast iron radiator is the correct size for each room space. This will save money on heating costs. What’s the difference between a thermostatic radiator valve and a manual radiator valve? A thermostatic radiator valve will allow you to adjust the heat output for each individual radiator. A manual radiator valve will only allow you to turn a radiator on or off. The thermostatic radiator valve gives you the option to keep living rooms at a comfortable constant heat and occasional rooms such as bedrooms at a lower heat. What colour can I have my radiator painted? You can choose from an extensive range of historical colours and metallic colour which we offer, or we can paint any colour you would like if you supply the RAL code. Alternatively you can choose a paint effect to highlight or antique your radiator especially if you have chosen an ornate radiator. Are Cast Iron Radiators suitable for natural energy eco friendly heat sources? Cast Iron Radiators work very well with natural heat sources as cast iron absorbs and retains the heat more efficiently as compared to the modern radiator. The heat from a cast iron radiator when utilising natural resources is gentle and consistent, a comfortable ambient heat is enjoyed. How will my Radiator arrive upon delivery? Your Cast Iron Radiators will arrive on a pallet via a specialised pallet courier. 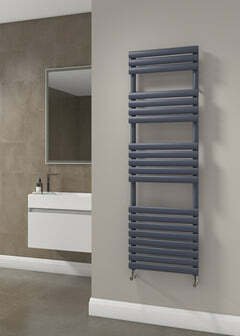 The radiators will need handling very carefully off the pallet and into position within your room spaces. There is a help sheet with every order to ensure your radiator is handled correctly during installation. What is the hand polished finish and how do I maintain the polished finish? The hand polished finish entails the radiator to be polished down to the bare cast iron metal leaving the radiator in its natural state with no finish upon it. It is a beautiful finish but does require some care as the bare metal will react with air and moisture and cause rusting to occur. This rusting is easily combated by gently polishing your hand polished radiator every 6-8 weeks with a polishing duster lightly sprayed with WD40. Can I wall mount the radiator rather than have it free standing? Yes you can have your Cast Iron Radiator wall mounted instead of free standing, however we do not advise larger radiators to be wall hung. Call us on 01803 450330 for more guidance. What is a wall stay, how do they work? A wall stay allows you to stabilise your cast iron radiator to the wall for extra safety especially where children will be using the room space. The radiators are free standing and quite firm on the floor however the wall stay will give the extra firm stability required to stop the radiators rocking backwards and forwards if sat upon or leaned against. Can I use my current pipe work? Yes you will be able to use your existing pipe work and a radiator can be built to fit as close as possible or your plumber will be able to extend or shorten your pipe work to fit. Modern pipe work is 15mm in diameter whereas older pipe work systems found in some period properties are 22mm. Most of the Cast Iron Radiator range can be ordered with 15mm or 22mm pipe connections. What is the guarantee on a Cast Iron Radiator? 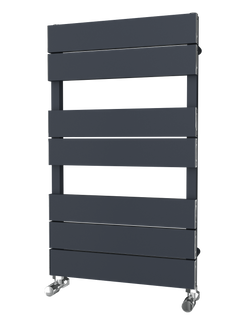 Cast Iron Radiators have a 10 year guarantee from all manufacturing defects which affect the usage of the radiator if the correct guidelines are adhered to upon installation. Will Great Rads speak with my plumber regarding technical information? Yes our Great Rads Sales Team will discuss any practical issues directly with your plumber or heating engineer if required. We also have an external sales team who will be happy to visit your project and to provide advice. Please call our National Sales Manager Rob Martin on 07796 714336 to arrange. Great Rads will provide upon request a specification sheet for your plumber or heating engineer which provides all measurements needed for installation room by room as well as all heat outputs per room. What is the difference between Delta 50 and Delta 60? This relates to the temperature of the hot water within your system, as the modern boiler emits to Delta 50 our BTU calculations are done using Delta 50, however if Delta 60 calculations are required please contact us on 01803 450330 for advice and calculations. 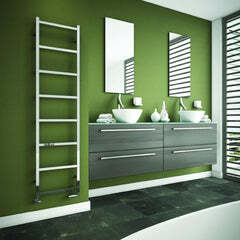 See our full range of cast iron radiators. Our cast iron radiators are shown in our free full colour brochure along with radiator valves and fittings. The Cast Iron brochure is full of ideas and suggestions and will be delivered to you by post as soon as you request it. Standard & Metallic Finishes - Striking metallic paint finish that is hard wearing and washable. Choose from Old Penny, Pewter, Antique Gold, Natural Cast, Sovereign Gold, Anthracite, Copper and Old Pewter. Hand Finished Antiqued Effect - Accentuates detailing bringing out the beauty of the raised etched mouldings on ornate radiators or brings an added depth of colour on plainer styles. Hand Finished Highlight Effect - The beautiful moulded detail is highlighted by hand on top of its base colour in a choice of rich gold, striking pewter or warm copper. If you require us to mix a paint for your radiators from an existing colour you are using to decorate and wish your cast iron radiators to match exactly, supply the RAL, BS number, paint name or sample. If you have a wallpaper you wish to match a colour to, please send a swatch to us. Being very imaginative with your cast iron radiator can really create a centre piece for any room.